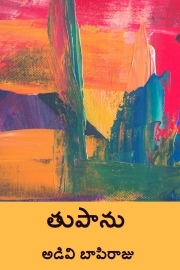 Description of "తుపాను (Thoofanu) (eBook)"
Thoofanu or Tupanu is a Telugu language novel by Adavi Baapiraju. Adivi Baapiraju (1895–1952) was a famous Telugu novelist, poet, playwright, painter and art director. Famous "Bava Bava Panneru" telugu song was also written by him. He was born on October 8, 1895, at Sarepalle near Bheemavaram in West Godavari district of Andhra. He is known for his works like Gonaganna Reddy, Narayanarao, and Himabindu. Reviews of "తుపాను (Thoofanu) (eBook)"